Rajasthan Royals found yet another way to lose a game when it gifted Chennai the tie with some sloppy bowling in the end. They have just one win under the belt so far and things are quickly going out of hand for Ajinkya Rahane and his men. A trip to Mumbai could only complicate matters as the hosts have been in fine form off late. A morale-boosting win over Punjab has given MI the momentum it was looking for to scale new highs. They will be looking to go to double figures in the points table with a win over Rajasthan. The two teams have played each other on 21 occasions with Mumbai claiming 11 wins, Rajasthan with 9 wins and 1 game producing no result. Here we take a look at how these teams performed in their last five games. Mumbai Indians vs Rajasthan Royals Live Cricket Score. Suryakumar Yadav and Evin Lewis got Mumbai off to a flier but after Yadav’s dismissal, it went downhill for the hosts as they failed to reach a target that merited the start they had. Mumbai Indians finished with 168/6 as Ben Stokes and Jofra Archer picked up two wickets each. In reply, Jos Butler finished with 94 as Rajasthan won by 7 wickets. A game almost on the line of the previous one with Mumbai managing 167/7 batting first with Suryakumar Yadav top scoring with 72. He received support from youngster Ishan Kishan who smashed a fifty but then the lower order crumbled. For Rajasthan, it took a partnership between Sanju Samson and Ben Stokes to steady their faltering innings but they did reach their at the end thanks to Krishnappa Gowtham. 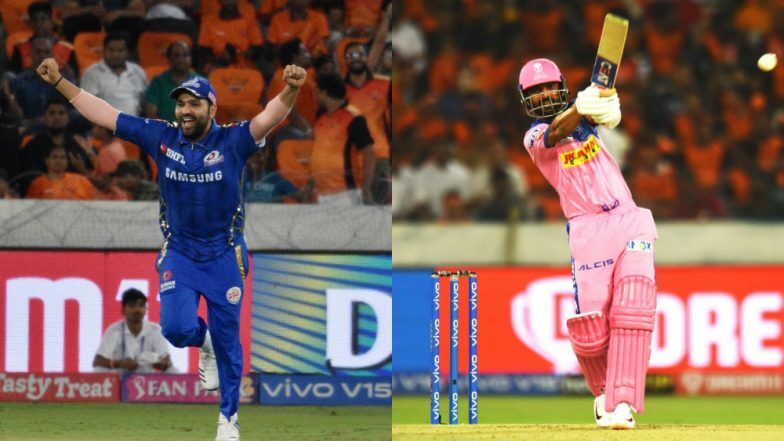 IPL 2019 Points Table Updated: DC Breaks Into Top Four on the Indian Premier League 12 Team Standings Following Win Over KKR. Ambati Rayudu hit a 27 ball 53 helping Mumbai put on 187/5 on board batting first on a flat track of Wankhede. Mitchell McClenaghan snapped up three wickets to bring his team back in the game when it looked Rajasthan would run away with it. His dismissal of Sanju Samson on 76 can be termed as the turning point of the match. Mumbai were in a spot of bother losing three quick wickets but Corey Anderson and Kerion Pollard put up a 104 run stand to take Mumbai to 164/5. Rajasthan riding on Steve Smith’s unbeaten 79 reached tehri target with five balls to spare. Mumbai’s inability to take wickets led to them losing the game. Shikhar Dhawan Remains 97 Not Out After Colin Ingram Finishes KKR vs DC Match With a Six!. Corey Anderson’s innings of 95 from 44 balls that included 6 sixes helped Mumbai Indians scale down the target of 190 set by Rajasthan. The Kiwi batsman fireworks meant the hosts finished the game under 15 overs to qualify for the playoffs leading to unprecedented celebrations in the stadium.